Revised and ExpandedWith the same trademark compassion and erudition he brought to The Man Who Mistook His Wife for a Hat, Oliver Sacks explores the place music occupies in the brain and how it affects the human condition. In Musicophilia, he shows us a variety of what he calls “musical misalignments.” Among them: a man struck by lightning who suddenly desires to become a pianist at the age of forty-two; an entire group of children with Williams syndrome, who are hypermusical from birth; people with “amusia,” to whom a symphony sounds like the clattering of pots and pans; and a man whose memory spans only seven seconds-for everything but music. 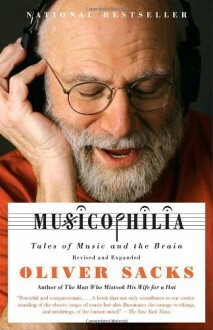 Illuminating, inspiring, and utterly unforgettable, Musicophilia is Oliver Sacks' latest masterpiece. Very interesting anecdotes and well written stories. The book unfortunately lacks a scientific gravity because there is no meaning or context given to the anecdotes. Feels more like a collection of random memories than a well structured book on music and the brain.